Save on a 2-Pack of Regular Replacement Filters for the Seychelle Water Pitcher and Clearly Filtered Pitchers. This Replacement Filter has the Seychelle™ Filter System for harmful contaminants and heavy metals filters up to 200+ gallons of drinking water! This 2-pack of OEM Seychelle Regular Replacement Filters (1-40100-W) are for the Seychelle Family Water Pitcher and also fits on the Clearly Filtered™ Water Pitcher. 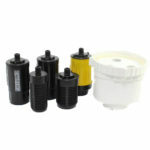 This replacement filter has the Seychelle™ Filter System for harmful contaminants and heavy metals. 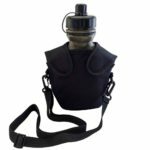 Filters up to 200 gallons of drinking water! Each filter produces up to 200 gallons of clean filtered drinking water. Removes up to 99.99% of contaminants and pollutants noted below. 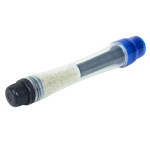 Replacement Filter with the extra radiological filter chamber is available here. This model replaces the older model #1-40300-W (same filter, Seychelle just changed the number for some reason). and other detergents and pesticides. Cool, clean, filtered water, with no nasty chlorine taste. Enjoy great-tasting chilled water 99.99% free from all contaminants. While most water filter pitchers only remove the obvious contaminants, like visible dirt and chlorine odor, the Seychelle Water Filter Pitcher goes much further. Because it contains our fast-flow Regular Filter, it removes up to 99.99% of all contaminants found in tap water – even ones other water filter pitchers leave in. What’s more, the incredible technology behind our filters means they actually retain beneficial minerals like calcium, magnesium and potassium. You get to enjoy all the health benefits of bottled water at a fraction of the cost. 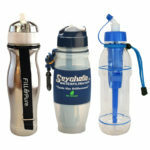 Save money on bottle water while saving the environment from repeatedly buying plastic bottles. The filter capacity is up to 200 gallons. There is no need to count the gallons, our filters will not expire, but the flow will become slower and slower until it is time to change the filter. Anything that comes through is safe and pure. We remove the same amount of contaminants at the end of the filter life as we do at the beginning. To enjoy safe, clean drinking water straight from the fridge, simply fill the top of the pitcher with tap water, and allow it to drain into the bottom of the pitcher. As the water quickly passes through the filter, contaminants such as chlorine, fluoride, industrial and agricultural chemicals, volatile organic compounds, and heavy metals are filtered out ready to drink. 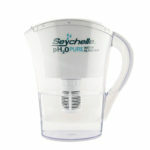 The Seychelle Water Filter Pitcher is made from highest quality BPA-free plastic. The filter lasts for up to 200 gallons of water. And because the pitcher has a huge 1 gallon capacity, everyone in the family can enjoy deliciously cool, filtered water, any time. 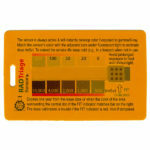 Note: If you have water that is high in nitrates or sediment/silt you may not get the full capacity of the water filter. The filter will remove these contaminants but may get prematurely clogged by larger particles. This could happen with tank water or rain water if there is no pre-filter. Flushing the filter will increase the capacity. Nukepills™ Filtration Systems are manufactured by Seychelle™ using an electro-magnetically charged resin that attract different contaminants in your water like chemicals and heavy metals. As water passes through the porous body of the water filter, these impurities are drawn to the surface walls of the filter where they remain trapped. All Seychelle™ water filtration products have been tested around the world for their efficacy, and they have been proven to offer the greatest reduction per contaminant in the industry. Will the filter wear out? The filter will not wear out, per se. However, the maximum filtering capability gradually diminishes and when the water flow is too low, it’s time to replace the straw. 200 gallons is the maximum. Be the first to review “2 Pack – Seychelle Water Pitcher Regular 1-40100-W Replacement Filters” Click here to cancel reply.